Curve approached Un.titled to produce a new brand and ticketing website that would exceed their customer’s expectations. Curve is one of the UK’s leading producing theatres and their productions have achieved widespread critical acclaim, attracting audiences across the UK and beyond. New developments and an expanding offer meant the old website was unable to accommodate Curve’s growing needs. Un.titled were tasked with producing a website that would meet existing and future requirements, while delivering a tailored experience that facilitated access and discovery. 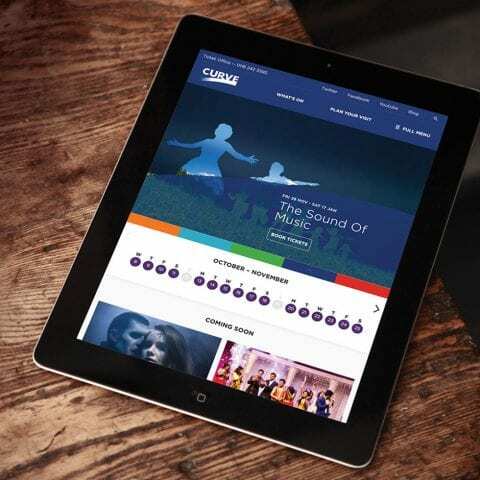 We then worked with Curve’s Head of Communications and Commercial Director to restructure content across the site and develop a content strategy. Research showed the majority of users were visiting the site on a touch device, so we adopted a mobile-first approach to designing the Curve website that would deliver a meaningful, context-driven experience on mobile devices. Curve’s branding was followed throughout and a visual identity system for interface controls and other elements was developed. Similar and ‘connected’ content was grouped together. Secondary in-page navigation menus allowed the user to navigate between grouped content creating a narrative from ‘behind the scenes’ through to ‘production images’. Performance and session data was regularly pulled into WordPress via the AudienceView API, which allowed us to display availability, performance types and purchase links all accurate to within 5 minutes. Un.titled have been a dream to work with. They have created for us a website that truly reflects our oganisation’s aims, objectives and brand – and made the experience for all our digital users and visitors so much more easy, fun, efficient and enjoyable.